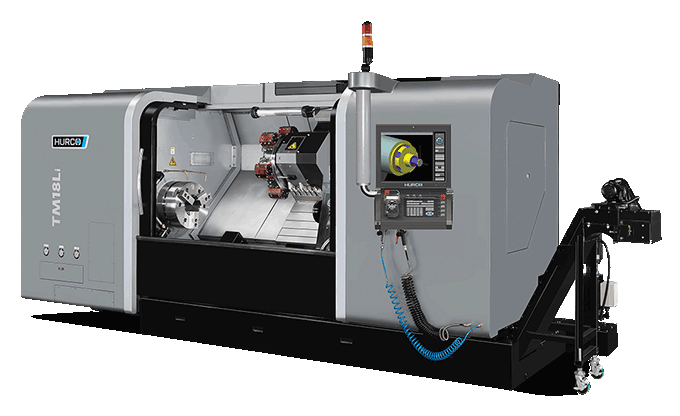 Our heavy duty slant-bed lathes are a prime example of customer-centric design. 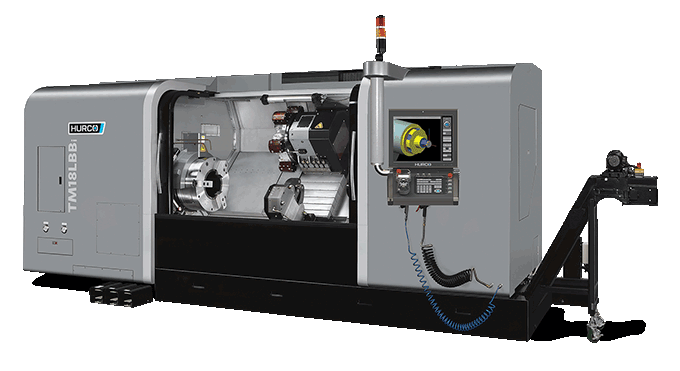 Hurco customers who are suppliers for the aerospace and energy sectors requested larger lathes with high torque capabilities and equipped with the Hurco control. 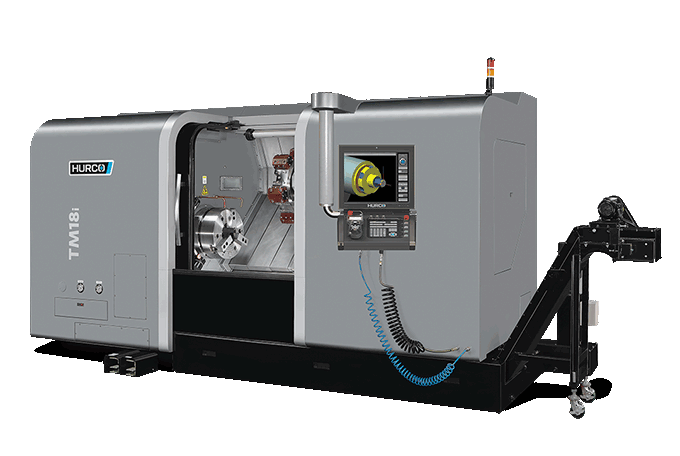 The larger heavy duty lathes are gear-driven to maximize torque. Our technology is your path to profitability. We believe hard work pays off. Premium components for premium performance. Steady rest, overhead hoist, and many more options for heavy duty turning. Rigidity is absolutely critical for turning heavy parts—that’s why we evaluate each design decision to ensure it promotes rigidity, reliability, and longevity. Design + Construction: It starts with a certified Meehanite® casting, which provides superb dampening characteristics that inhibit thermal deformation and twisting. This robust machine tool features oversized Z-axis guide rails that are strategically spaced to provide excellent support to the cross slide. A wide saddle increases rigidity even further. Ultimately, all of these design features mean the Hurco heavy duty lathes can withstand heavier loads. Maximum Torque The TM heavy duty turning centers are equipped with a two-speed gear box that gives you the ability to achieve maximum torque at low speeds and maintain adequate torque at high speeds . Servo Turret: Fast turret with 12-tool stations is designed to provide faster and more accurate tool indexes. You can use any combination of ID and OD tool holders. Heat Isolation System: Since heat is the enemy of machine tools, we’ve isolated heat producing components and added a spindle chiller to promote thermal stability and minimize heat dissipation. Machining Capacity: The generous turning diameter and turning length allows a wide range of large and long part sizes. At the heart of the TM heavy duty, slant-bed lathes is the power and flexibility of the integrated Hurco control powered by WinMax®. 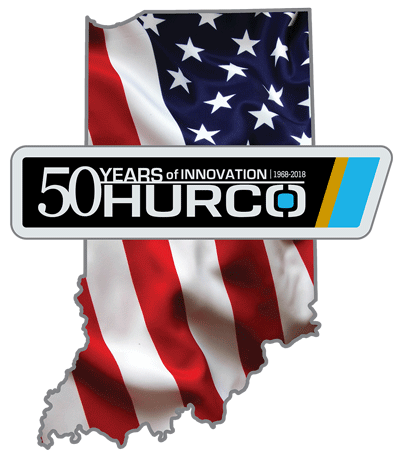 The control can be programmed on the shop floor with Hurco's patented conversational programming or industry standard NC. Our control lets you choose the best method of programming for your shop and for each individual job. No other control offers the level of flexibility that you will experience with the Hurco control. Additionally, the easy-to-use touch screen provides helpful setup and verification graphics that show cuts on the screen before they are executed—virtually eliminating wasted materials and potential machine crashes. Our control technology is the greatest advantage of our lathes because the technology we develop yields the greatest opportunity for our customers to increase profitability via increased productivity. With large capacity memory, a fast processor, and multiple control features that minimize setup time, you will benefit from a control that helps you get from print to part faster. However, expert design and premium components add to the reliable performance of our heavy duty slant-bed lathes. Spindle designed for maximum torque: The spindle features a cartridge design packed with lifetime grease, which provides maintenance-free lubrication. To maximize torque, the spindle is equipped with a gear box that switches gears automatically to provide best torque available at a given speed. Guide ways: The guide mechanism for the axes is fitted with precision linear ball rails and box ways for the tailstock. Our linear rails are built with the same precision grinding technology used in the manufacture of bearings because this technology provides superior acceleration and deceleration performance at full load-carrying capacity in all directions. Using Finite Element Analysis (FEA) technology, the size and spacing of the linear ball rails have been carefully matched to the machine’s static (precision boring) and dynamic (cutting and traversing) operating requirements. Each bearing block is independently and automatically lubricated to promote long life. Steady Rest: Large capacity SMW Autoblock steady rest for supporting long parts. Parts Catcher: Reliable, tailstock mounted parts catcher with wide bucket to catch parts easily. Bucket extension is programmable to desired position at precisiley the right moment. Parts transferred to enclosed bin mounted outside sliding access door. Parts Conveyer: Moves parts from catcher bin to secondary operations such as a parts washer or parts tumbler for lights out manufacturing. High Pressure Coolant: Provides up to 1000 psi for deep hole drilling.